Schroeder Opening: Let there be joy! Let there be thanks! Let there be music! The public is invited to a new kind of musical experience at Sonoma State University when the doors of Schroeder Hall at the Green Music Center open to the public on August 23. 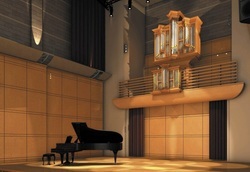 Complementing the airy grandeur of Joan and Sanford I. Weill Hall, Schroeder’s intimate, 250-seat interior will bring every musical vibration and overtone into relief. Two days of nonstop celebration will include performances by jazz pianist David Benoit, the musical heir to original Peanuts composer Vince Guaraldi; classical pianist Jeffrey Kahane, conductor laureate of Santa Rosa Symphony and music director of the Los Angeles Chamber Orchestra; and Ruth Ann Swenson, Metropolitan Opera soprano and SSU voice instructor. Guest organists will perform on the hall’s centerpiece Brombaugh Organ. Additional artists include the Music Department chamber artists in residence Trio Navarro; Weill Hall artists in residence Trio Ariadne; and the Sonoma Bach Choir. And a new work will receive its premiere – “Stood the Seraphim” for organ and brass choir by composer and Music Department chair Brian S. Wilson. Tickets are free but required for admission. Tickets for this event must be reserved through the SSU Box Office. Visit gmc.sonoma.edu or call (866) 955-6040 or email tickets@sonoma.edu A limited number of tickets will be available at the door. Schroeder Hall was named by philanthropist Jean Schulz after the beloved piano-playing character from the Peanuts cartoon created by her late husband, Charles Schulz. Schroeder Hall is located next to Music Education Hall on the southern end of the Green Music Center complex. Parking is available in Lots O, L, M, and N.